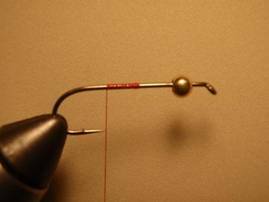 Put a size 6 muddler/ stonefly 3x long hook into a vise, after putting on a round bead head. 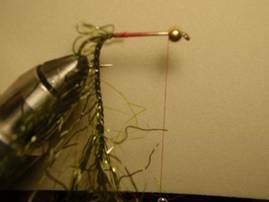 Attach red thread, and wrap back towards the bend of the hook. 2) Tie in a short, 5 inch piece of Al's silly green yarn. Any green silly yarn will work, but I especially like the kind Al gave me. 3) Wrap the silly yarn, up towards the round bead, pulling the threads back, as you wrap forward. This will help insure that the silly part of the yarn is not wrapped under. This makes the stringy part all flow behind the bead head. 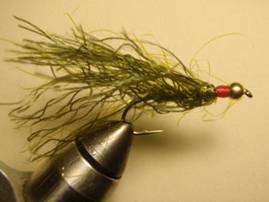 4) When finishing the fly, wrap a very heavy amount of the red thread to finish the fly, really to show off the red color, right behind the bead, and then whip finish. 5) Then take your fly, to your favorite stretch of creek or river, and use a sinking line to get the fly down and go catch a hundred!! That's what we do! This was a favorite fly pattern of the late Al Crise. Thanks Al, for the fly pattern, materials, and memories. All of which will be missed!! 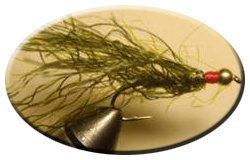 Beginning Fly Tying | Intermediate Fly Tying | Advanced Fly Tying.